Our Guide and Philosopher. 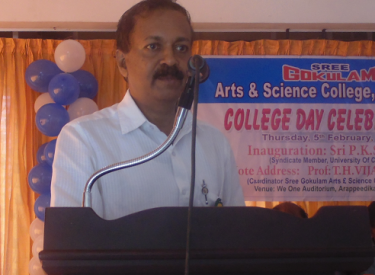 Sree Gokulam Arts & Science College is the realization of his dream project. Prof. Vijayaraghavan TH guides us through his visionary path featured by his working experiences. He manages the institution through his farsighted views. He is a constant researcher of better educational systems through his exploration of worldwide institutions.